Table Tennis is a growing sport at Newington supported by professional coaches. Table Tennis has been played over many years at Newington. Although not an official AAGPS Sport, Table Tennis is growing in popularity and we encourage all players to participate in competitions between schools. The Concordia Centre across the road from the Stanmore Campus is the home of Table Tennis at Newington housing 14 tables and a coaching robot. The Concordia Centre across the road from the Stanmore Campus is the home of Table Tennis at Newington. It houses 14 tables and a coaching robot. Historically the Concordia Centre formerly known as The Concordia Club was home to a Table Tennis club from the 1970s until 2000. 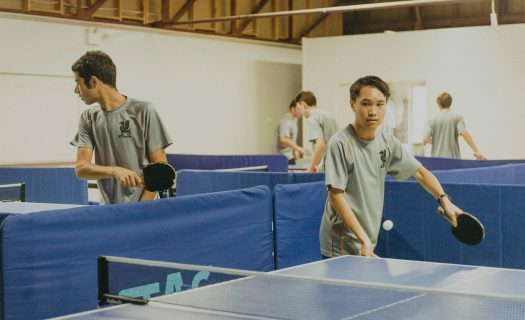 Today, there are facilities that will accommodate up to 60 students, and the boys receive professional coaching from Mr Guy Fairnbloom, Junior Coaching Director for Table Tennis NSW, assisted by Newington teaching staff, Mr Alex Pyne, Ms Julia Gonzales and the Director of Table Tennis, Mr Jock Canning. Boys participate in three 90 minute training sessions per week in Terms 1 and 4. Our competition teams over the season continued their dominance of the six schools competing again confirming Newington College as the overall best performing school. With other schools embracing stronger training regimes and having qualified coaches the standard of play continues to improve. In Term 4 2018 and Term 1 2019 the Homebush Olympic Sports Hall became the permanent venue each Saturday for our schools competition. This brought together 100 players and staff and with consistent conditions for play the competition thrived. It also enabled staff to share ideas about our future with a central competition venue being supported by all. The competition this year has been the strongest yet with Kings School and Knox Grammar School vying for overall Champions with Knox Grammar School winning by a small margin of four points. Newington this year finished third overall. The challenge for us is to rebuild our strength by continuing our competitive training regimes and a playing style that encourages the development of Table Tennis as a lifetime sport.